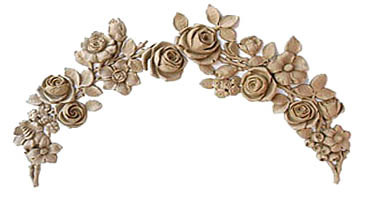 These beautiful carved rose appliques are the perfect touch for turning your vintage finds into Shabby Romantic treasures! All of our appliques are exact copies of wood carvings that were done by French and other European artisans back in the 1800's!! These highly detailed pieces are made of a composition type material that can be painted or stained, and are easily glued onto nearly any surface. Recommended application is within 2 weeks. However, that time can be extended by keeping the appliques stored in a cool dry location. Beautiful Large Rose and Floral Swag! Measures 5" high x 26" long.